How a movie begins can be very telling of what the entire film will be like. 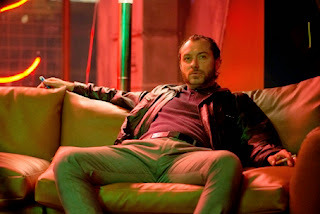 “Dom Hemingway” opens with Jude Law’s title character speaking to the camera, boasting of his sexual prowess while in prison, introducing himself by his reputation. When Dom is released shortly thereafter following his twelve-year stint, he sets out on a rampage to let those who wronged him know that he won’t take it laying down, and has some trouble treating those who are still his friends as anything but, which makes his future look increasingly less promising. Like Dom, this film is a loud, aggressive experience more often excessive than entertaining. Law is a prolific actor who, throughout his career, has had the chance to play a variety of roles. Among his most memorable are the noble nice guys of “The Talented Mr. Ripley” and “Cold Mountain,” with a few bad boys like his characters in “Alfie” and “Sleuth” mixed in. Here, he gets a rare opportunity to be a truly despicable person, one who thinks only of himself, values money and vengeance over everything, and displays few positive qualities. Law gives it his all, matching his out-of-style facial hair with equally prickly fury. However polarizing and off-putting Dom may be, there’s no denying that he is a fascinating cinematic character. His boldness and temper make him a magnetic protagonist, one whose post-prison days are made immensely watchable by the extreme nature of his words and actions. Unsurprisingly, his story contains other people with questionable moral characteristics, and the intersection of all these players make for one out-of-control ride that can’t possibly head anywhere productive or sunny for the one and only Dom Hemingway by film’s end. Joining Law in the cast are a few notable actors who help to strengthen the film with focused performances. Richard E. Grant controls his every facial tic and mannerism as Dickie, Dom’s one true friend who never manages to stick up for himself in the way that he should. Demian Bichir is an eccentric and terrific villain in Mr. Fontaine, the mob boss who hosts his loyal underling following his release from prison. Above all, Kerry Condon steals the film as the one truly kind-hearted character in the film, the sweet Melody, who Dom meets at Mr. Fontaine’s and seems completely immune to the terrible things that happen around her. 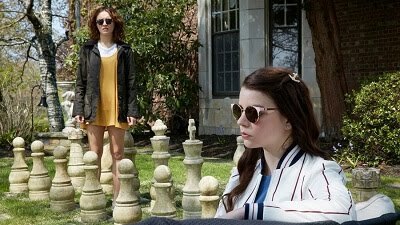 The film as a whole doesn’t benefit from that same optimism, and as a result it’s an odd and overly boisterous outing that doesn’t feel entirely cohesive and certainly isn’t pleasant.